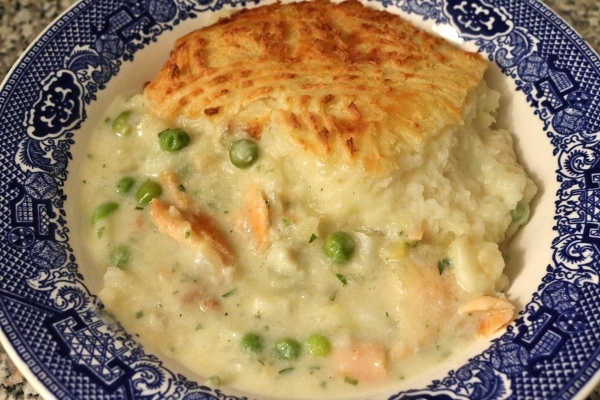 Fish pie. It never really sounded appealing to me until recently. It seems like overnight I suddenly had the urge to create this classic dish. 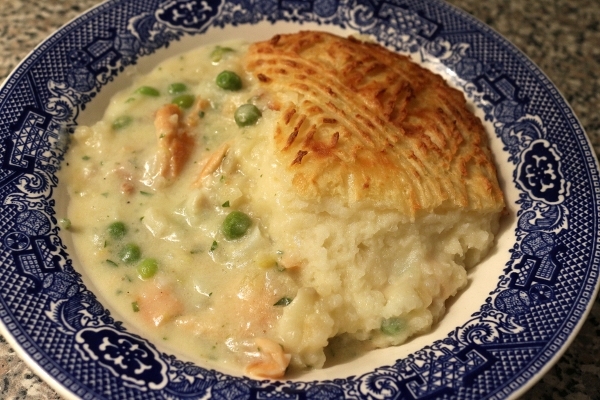 It's mostly British in nature, but I've also seen it described as Irish fish pie, and since there's a lot of crossover for food (shepherd's pie vs cottage pie, for example), I figure this is another case where you can call it either British or Irish depending on your mood. I'd normally call it British, but today I'm going with Irish just for the sake of celebrating St. Patrick's Day, which is just around the corner. It seems like as good an excuse as any! Recently, I invited a friend of mine over to watch The Fall, a Northern Irish crime drama starring Gillian Anderson and Jamie Dornan. We are both huge Jamie Dornan fans--he was also on Once Upon a Time, another show I love, and is playing the coveted role of Christian Grey for the upcoming Fifty Shades of Grey movie. 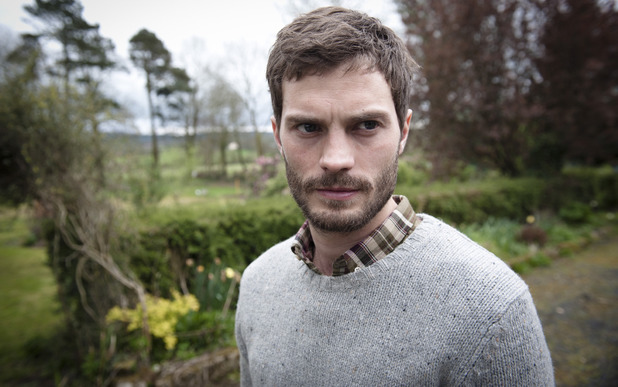 He's a Northern Irish actor playing a twisted serial killer in this Northern Irish show. I thought making something Irish/British would be apt for our marathon watching of the first season of the show (which is awesome by the way--can't wait till season 2). The fish pie was a lot better than I expected. The filling is creamy with a nice brightness from the lemon zest. It's smoky from the smoked salmon with a nice seafood flavor without being too fishy. The cod is a nice delicate fish choice especially next to the more assertive smoked salmon. I would normally think it's crazy to put cheese anywhere near fish, but I've seen this fish pie made with a mashed potato topping either with or without cheese. I decided to take the plunge and add some nice Irish cheddar (see the Irish theme here?). 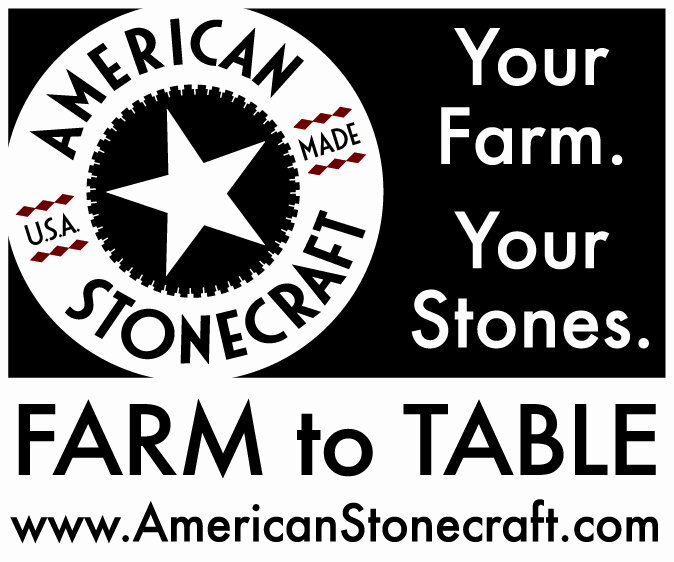 It adds a sharpness and richness to the mashed potatoes. Even in conjunction with the fishy filling, it really works. It simply adds more flavor, and more flavor is never a bad thing. I'm happy to say that fish pie was more impressive than I expected. 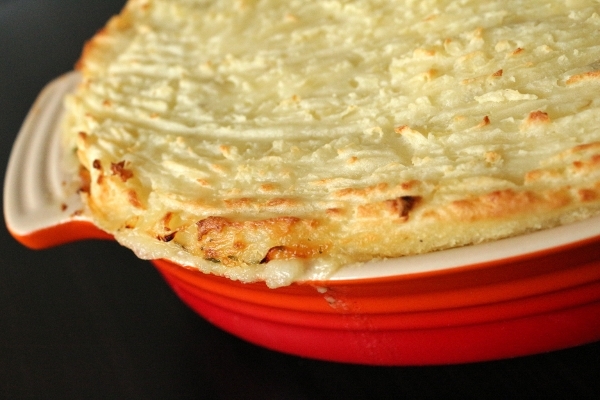 It's almost like shepherd's pie meets a pot pie... made with fish. It's comforting, creamy, flavorful, and a pretty balanced meal. No side dish necessary, expect maybe a light, green salad for freshness. 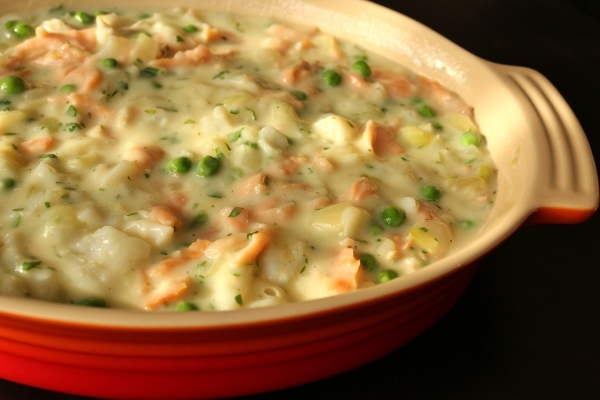 Whether you create this dish for a St. Patrick's Day supper or for an Irish-themed television marathon starring a former Calvin Klein model nicknamed "The Golden Torso" (and yes, that label fits him perfectly--wink wink nudge nudge), this fish pie is whole lot of comfort! I broiled the fish pie between taking the majority of the photos and serving it--hence why the topping is so much more browned here than in the other photos. Yummy either way! Preheat the oven to 375 degrees F. Line a baking sheet with foil. Grease a 2-quart baking dish, place it on the foil-lined baking sheet and set aside. To make the topping: put the potatoes in a pot of salted water and bring to a boil. Boil until the potatoes are tender and drain. Mash the potatoes with the milk, sour cream, and cheddar cheese. Adjust seasoning with more salt, if needed. Cover and keep warm until needed. To make the filling: Heat the milk and bay leaf to a simmer in a medium saucepan over medium heat. Add the cod and poach for about 5 to 7 minutes or until it is cooked through and begins to flake (the time is dependent on the thickness of the fish). Carefully strain out the fish and set aside, breaking it up into large bite-size pieces. Discard the bay leaves, but reserve the hot milk. In a large pot add the butter or olive oil and heat over medium-high. Add the onions and saute until they begin to soften, about 3 or 4 minutes. Add the garlic and cook another 2 minutes. Mix in the flour and stir to coat all of the onions with it. After another minute, gently begin whisking in the hot milk (from poaching the fish). Whisk until smooth and then simmer for about 5 minutes or until it thickens enough to coat the back of a spoon. Season with salt and pepper as needed. Stir in the peas, parsley, and lemon zest. 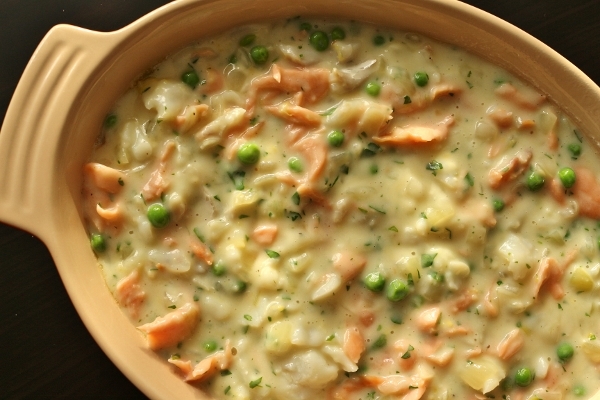 Fold in the smoked salmon and poached cod gently, then pour the mixture into the prepared baking dish. Carefully top with the mashed potatoes, sealing in all the edges first (to prevent the filling from bubbling over the edges too much) and then cover the remaining filling with the remaining mashed potatoes. 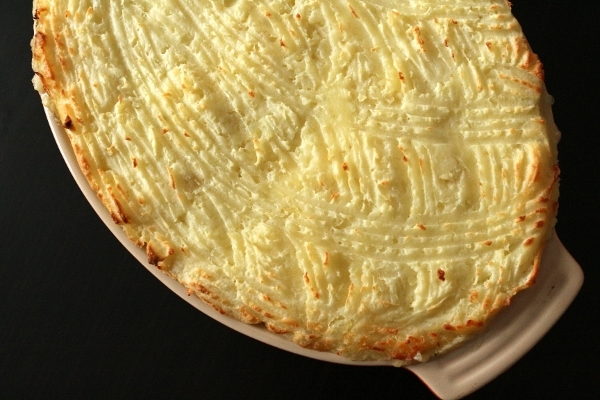 Use a fork to draw lines over the mashed potato topping to give it texture. 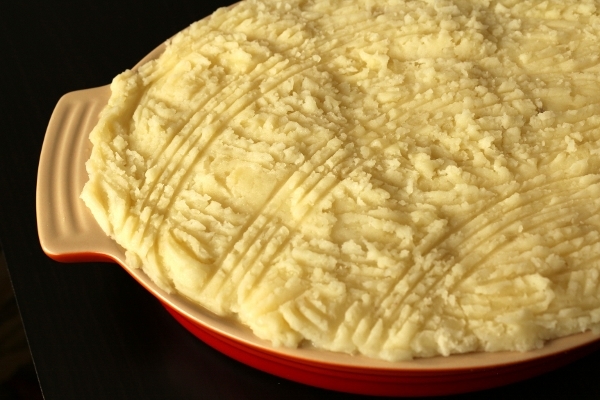 Bake the fish pie for 30 to 35 minutes or until the filling is bubbling (it may bubble out of some of the edges) and the topping starts to brown. At this point, you can broil the fish pie for an addition few minutes to brown it more, if desired. Serve immediately in wide individual bowls.